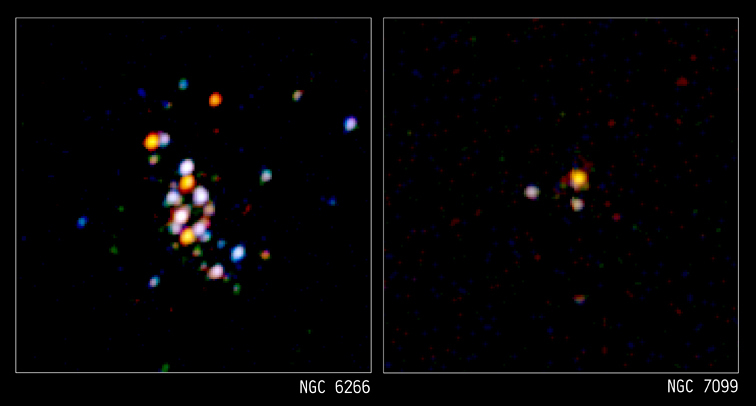 Chandra's unique ability to precisely locate and resolve individual X-ray sources in 12 globular clusters in our Galaxy has given astronomers a crucial clue as to the origin of these sources. Two clusters, known as NGC 6266 (or M62) and NGC 7099 (or M30), are shown here. A globular cluster is a spherical collection of hundreds of thousands and even millions of stars buzzing around each other in a gravitationally bound stellar beehive that is about a hundred light years in diameter. The stars in a globular cluster are often only about a tenth of a light year apart. For comparison, the nearest star to the Sun, Proxima Centauri, is 4.2 light years away. Most of the point-like sources in these images are binary star systems containing a collapsed star, such as a neutron star or a white dwarf star, that is pulling matter off a normal companion star. While direct, head-on collisions between stars are rare even in these crowded circumstances, close encounters occur and can lead to the formation of binary star systems containing a collapsed star. The images illustrate a general trend observed for globular clusters. 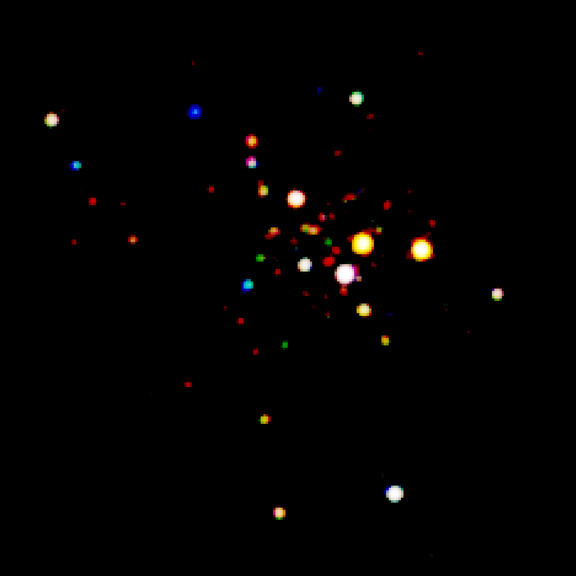 Clusters such as M62 where the stars are packed very closely together and the rate of close encounters is high have more X-ray binaries than those such as M30 in which close encounters occur less often. This is strong evidence that the X-ray binaries in globular clusters are formed by close encounters. Scale Image is approx. 1.9 arcmin on a side. Coordinates (J2000) RA17h 01m 12.60s | Dec -30° 06' 44.50"
Credit NASA/CXC/UIn/H.Cohn & P.Lugger et al. Coordinates (J2000) RA 21h 40m 22.00s | Dec -23° 10' 45.00"